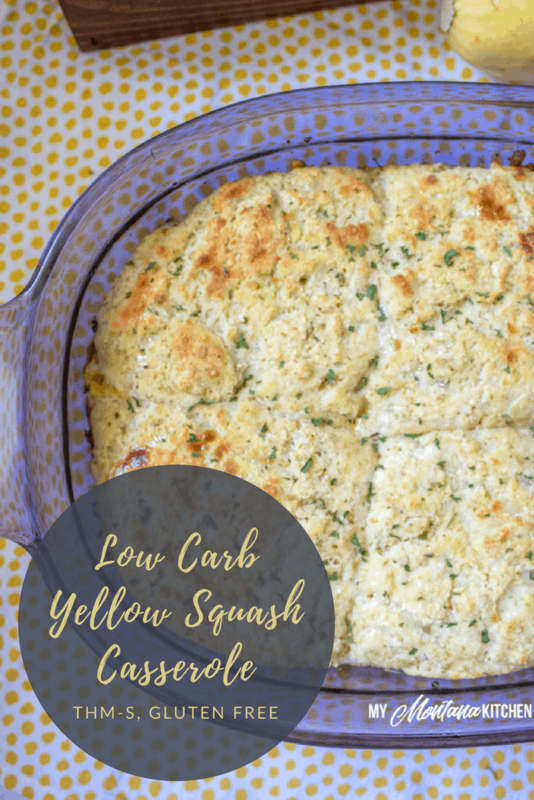 This easy Yellow Squash Casserole is filled with cheese, italian seasonings, and topped with low carb biscuits. You can use it as a stand-alone vegetarian main dish, or as a side dish. 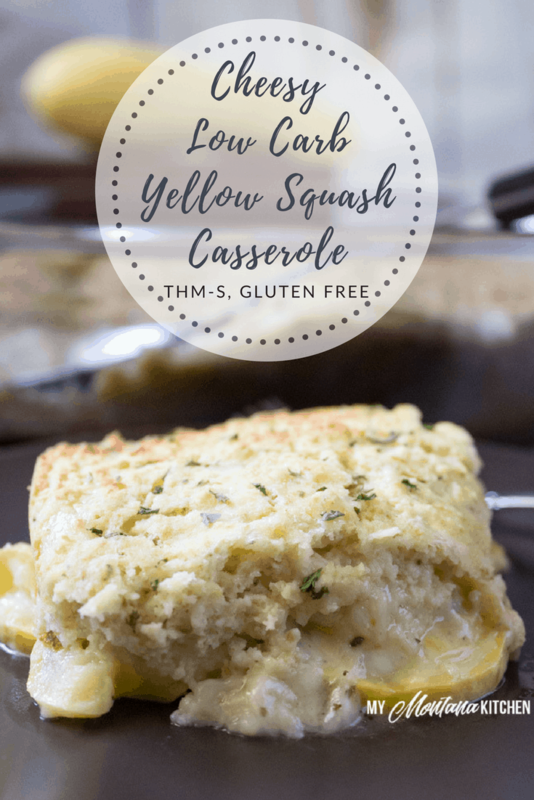 This delicious and cheesy summer squash casserole is also a Trim Healthy Mama S Fuel, as well as being low carb, keto friendly, and gluten free! But it is so delicious, that everyone will love it! I’m afraid that squash (at least the yellow variety) often gets a bad rap. You say “squash casserole” and it may bring up memories from your childhood that you would rather forget. But in my case, Squash Casserole was something my sister and I requested often. I’m sure the reason we requested it was because to us, my Mom’s recipe tasted like pizza! In fact, we actually called it “Pizza Casserole.” True story! It tasted like pizza because of the Italian seasonings and the mozzarella cheese used in the recipe. So on nights when it was just the girls at home, my Mom would sometimes make this easy casserole for us to enjoy. The traditional version of the casserole uses canned biscuits, both in the bottom of the dish, and on top. I knew you guys would be interested in squash recipes during the summertime, so I asked my Mom if she still had the original recipe. Unfortunately, she could not locate it, so we had to try to remember how to assemble it, and I changed some ingredients to make it Trim Healthy Mama friendly (and low carb)! And now we have this Cheesy Yellow Squash Casserole that tastes just like I remembered, except now, it is friendly to my waistline! There is no need for a sour cream or mushroom soup based sauce in this recipe because of the amount of cheese. And guess what? You don’t even have to saute the squash before baking! I just slice it raw and layer it with the cheese. (I don’t even peel it!) The squash is perfectly tender after baking. Now, about the low carb biscuit topping . . . these biscuits work great as a side dish on their own as well! I love to use the Trim Healthy Mama Baking Blend in these biscuits, but no worries if you do not have the blend! You can also use an equal mix of almond flour, coconut flour, and flax meal in place of the Baking Blend. The biscuits will still taste great! The Mozzarella and Cheddar cheese can easily be substituted as well. I think this dish would taste great with shredded Gouda! 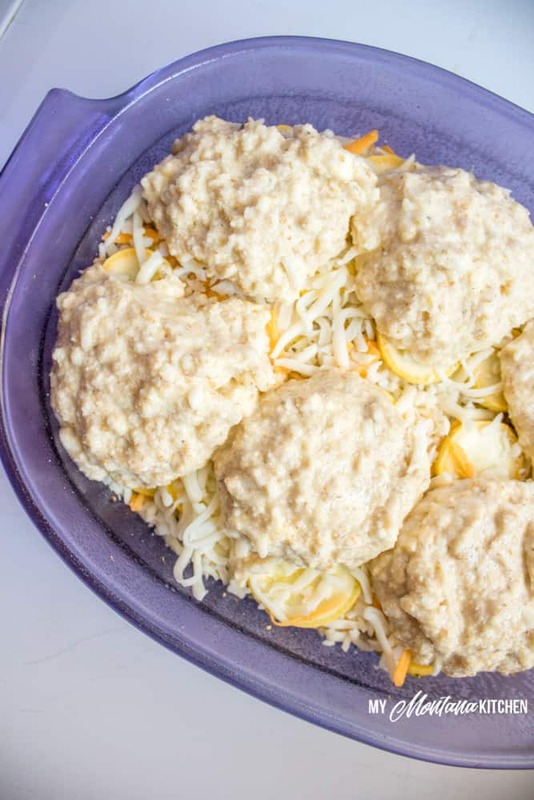 If you wanted to turn this low carb casserole into a full meal, I’m sure you could add some cooked chicken to bump up the protein count a bit. However, if you use the Baking Blend, it is higher in protein, giving this casserole 17 grams of protein per serving! Serve it with a side salad, some fresh cucumbers or roasted green beans, and you have a delicious, family-friendly meal. Assembling the casserole is so easy – I just layer the squash, seasoning, and cheese several times, then drop the biscuits on top. Then it is ready to go in the oven, (and you can sit down and prop up your feet for 40 minutes)! So what exactly do you need for this Yellow Squash Casserole? Mix up Low Carb Biscuit dough, adding the oregano, onion powder, and garlic powder to the dough. In a 2 quart baking dish, place a layer of squash in the bottom. Top with 1/3 of the cheese, and 1/3 of the Italian seasonings. Drop biscuit dough on top of squash mixture. If you do not have Baking Blend for the biscuits, you can use an equal mix of almond flour, coconut flour, and flax meal. 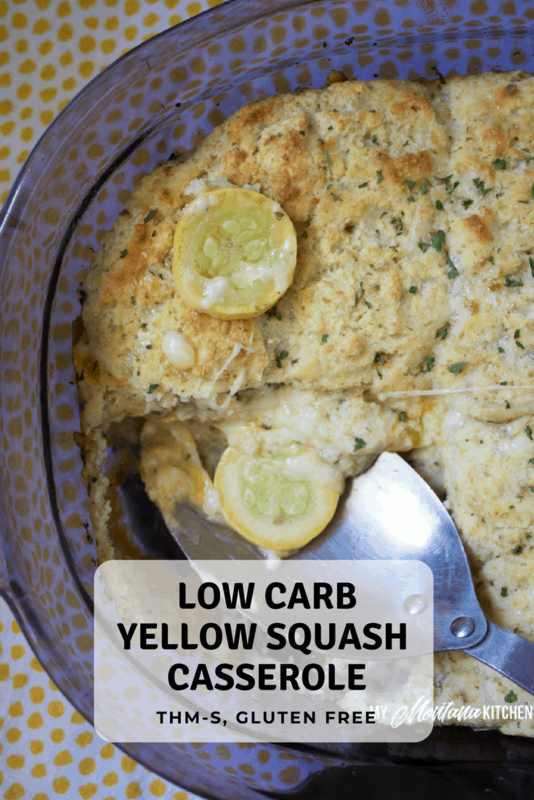 I love yellow squash, so this sounds amazing! I used to make a yellow squash pie, and added ground cooked sausage to it. I will be trying this one soon! Thank you! 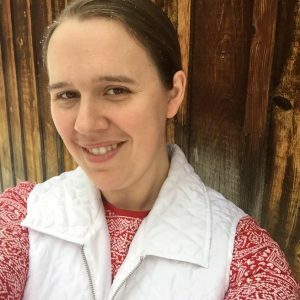 That sounds great – I hope you enjoy! Perfect timing since we had a bunch of yellow squash fresh from the garden. I tried this at supper tonight and it got great reviews from my family! I peeled half and left the peel on the other half. My crew definitely preferred it peeled. It reminded me a bit of cheesy scalloped potatoes with a delicious biscuit topping! I am so glad your family enjoyed it! My garden is providing the squash, will be making this very soon! I need to find a Zucchini muffin/bread recipe too. If you were close by I’d share garden produce. Thank you!